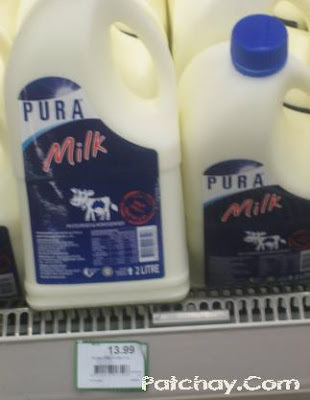 A bottle of 2L Pura Milk (from Australia) cost RM13.99 in Malaysia. It's freaking expensive when we pay only a few dollars in Australia. Happy New Year 2010, folks!!! The Grammy-winning R&B star will be in town as part of his “Year of the Gentleman” world tour. For more information, kindly contact Ticket Hotline. SNSD is scheduled for their 1st Asian Tour that will include Seoul, Shanghai and Bangkok this month. Taiwan, Singapore and Malaysia are possible future stops for the Girls. Le Van said he opened the grave because he wanted to HUG her. The 55-year-old, from a small town in the central province of Quang Nam, Vietnam, moulded clay around the remains to give the figure of a woman. He then put clothes on her and placed her in his bed. Van came up with the idea after his children stopped him from digging a tunnel into the grave. After his wife died in 2003 he slept on top of her burial plot for 20 months. But worried about rain, wind and cold, he eventually decided to dig the underground passage "to sleep with her". His kids found out and prevented him from going to the grave. So one night in November 2004 he dug up his wife's remains and took them home. The father of seven said neighbours did not dare visit the house for several years. He said: "I'm a person that does things differently. I'm not like normal people." Cut and paste story as reported by The Sun (UK) 27/11/09. 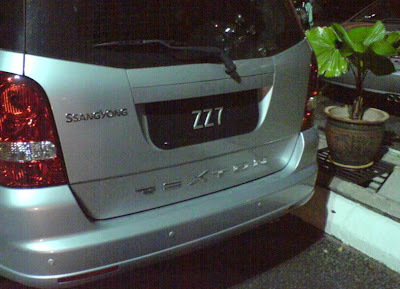 Kuala Lumpur's No.1 nightclub - Zouk - is finally expanding its business. 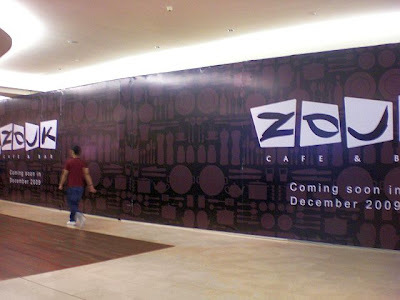 In December 2009, Zouk will make its first entry into F&B with the introduction of Zouk Cafe-Bar opening at one of KL's most prestigious shopping mall, The Gardens at Mid Valley City. For more info, visit www.zoukclub.com.my. Traffic jams are getting worst. Public transport often unreliable. Roads are pedestrian unfriendly. 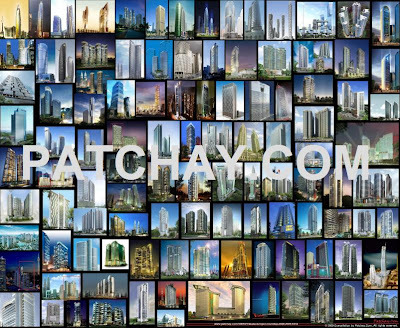 But like other booming Asian cities, more glamorous Skyscrapers are being planned and constructed. 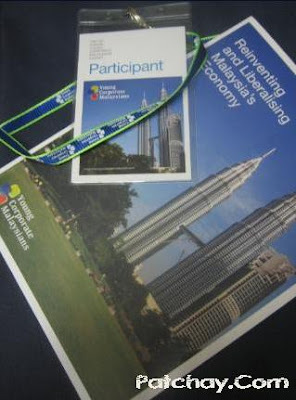 I'm talking about Kuala Lumpur in Few Years Time. 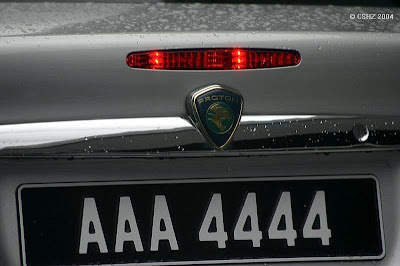 According to TheStar on 9 November 2009, the most expensive number plate in the country is for a vehicle registered in Terengganu but owned by a businessman in Johor Bahru. 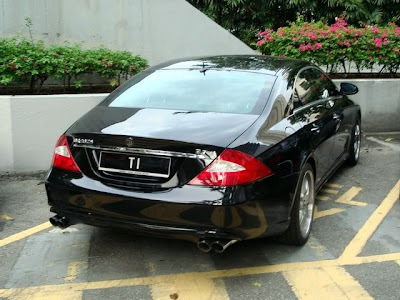 The number TAN 1 went for a pricely sum of RM200,090. 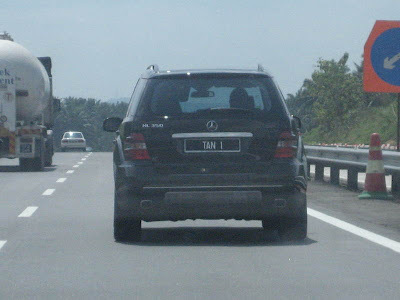 So, there you go TAN 1 spotted on the road!! Photos courtesy of SSC forumers cooltemper, sze hoong and hetfield85. Flight AK5606 was on its way to Kuching but had to be re-routed to the low-cost carrier terminal (LCCT) in Sepang, 30 minutes after the aircraft left Bayan Lepas Airport in Penang. 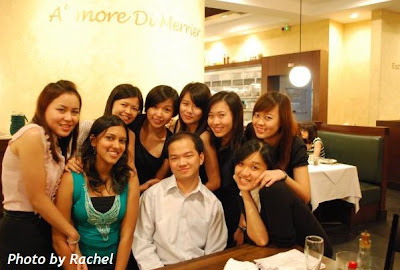 Liew Siaw Hsia, a 31-year-old waitress from Taiping, took the flight last night when she was just 27 weeks pregnant, a week shy of the recommended travel ban for pregnant mothers. When she boarded the flight, she said that there was already some discomfort. But 20 minutes into the journey, she started feeling contractions. Edd Razhe, the personal assistant to the AirAsia chairman, said when the pilot was informed of the emergency, he contacted the control tower requesting a diversion to the LCCT. "When I started feeling a lot of pain, I was still too nervous to ask for assistance. 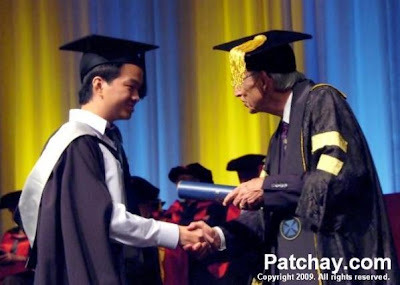 It was when I couldn't take it anymore that I asked the passenger beside me for help," said Liew. She said that the flight attendants tried to calm her down and to hold on from giving birth, but the pain was too unbearable. "They immediately asked the other passengers sitting around me to move elsewhere, and asked for a doctor on the PA system," she said. On the flight was Dr Ronald Tang, another passenger, who quickly volunteered his services to the nervous mother while the cabin crew held her hand throughout the entire ordeal. The healthy baby was safely delivered in mid-air. He became the first born in an AirAsia aircraft. As soon as the aircraft landed, a waiting ambulance and paramedics whisked the baby and mother to the Putrajaya Hospital. Edd said although it was an emergency, situation in the aircraft was normal and under control. AirAsia director of operations Moses Devanayagam visited the mother and child yesterday to congratulate them. 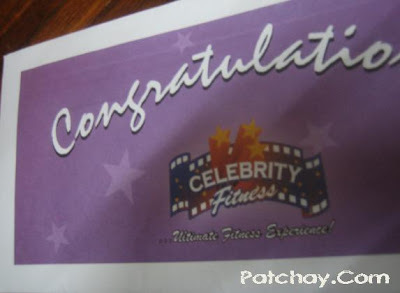 "I would like to congratulate Liew and wish her all the best of luck. "Delivering a baby at 2,000 feet is indeed a very rare experience, and certainly she will cherish the moment forever," he said. AirAsia chief Datuk Tony Fernandes, who is in Bangkok flown back to Kuala Lumpur to celebrate the arrival of the baby at the hospital. AirAsia has announced that it will provide a lifetime of free flights to both Liew and her son to all (AirAsia) destinations. 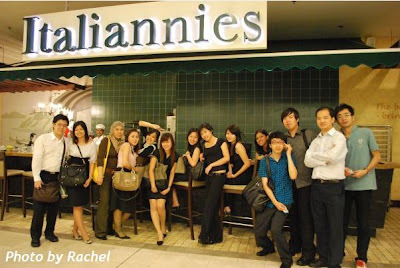 By mid-April 2010, Debenhams will occupy 3 levels in Lot 10, a major upmarket mall in shopping district Bukit Bintang. The new store at Lot 10 will bring in a number of first-in-Malaysia ranges such as the highly anticipated Principles by Ben de Lisi; Butterfly by Matthew Williamson for women; and labels carried by London Fashion Week designer Henry Holland. Other brands made availabe are Ben Sherman, Fred Perry, Ted Baker, John Rocha, Julien MacDonald, Jasper Conran, Red Herring, St George by Duffer, Thomas Nash, Jeff Banks, Maine New England, Sonneti and Mantaray. 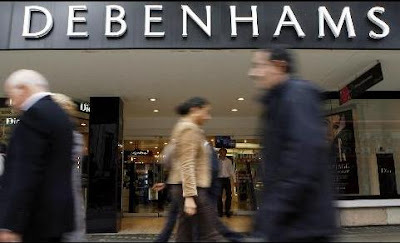 Debenhams opened a 100,000 sq ft store in Berjaya Times Square Kuala Lumpur for a brief stint between 2003 and 2006. Debenhams returned to Malaysia with a suburban store at The Curve Mutiara Damansara last year. 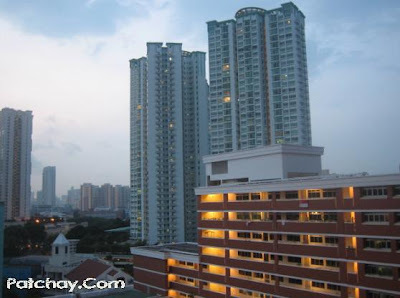 She was panned in the media for her poor command of English, and then made headlines again when a Singaporean paper reported that she was sentenced to 24 months of probation for credit card frauds in May. Last Friday, Ms Ris Low has confirmed her conviction on 5 charges of misappropriation, cheating, using illegally obtained credit cards, and impersonating their users' identities. "If I'm feeling naughty, then I'll wear something RATT and LOUD !! Something you know.. BOOMZZZ..."
She of course made me laugh. Syarikat Prasarana Negara Bhd (SPNB), the state-owned public transport operator, plans to spend up to RM7 billion to extend 2 light rail transit (LRT) lines in Kuala Lumpur. 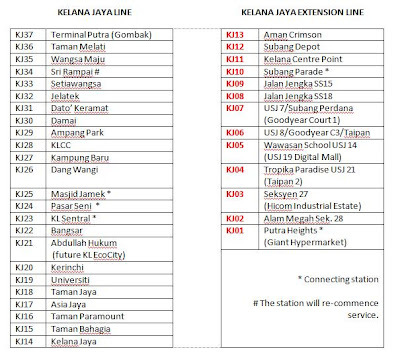 The 2 extension lines will cover a total of 34.7km and is due to start early 2010 and fully completed by end of 2012. 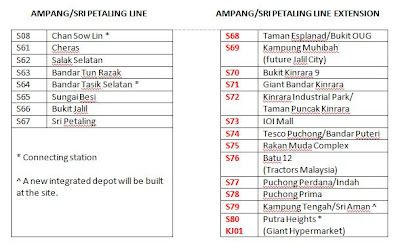 In line with the extension of LRT lines, SPNB will also embark on fleet expansion. 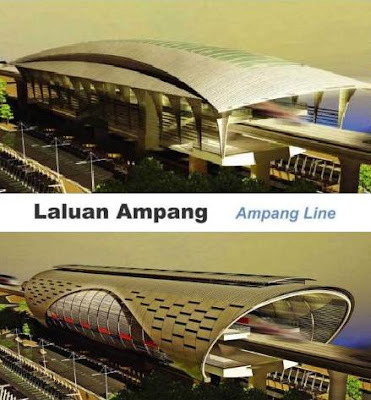 It was also reported that the Kota Damansara - Cheras Line will begin construction as early as 2011 and completing in 2014. Current average daily passenger volume is 180,000.
covering a total of 17km. Fleet expansion: 35 more train sets of 4 cars per set configuration. Current average daily passenger volume is 170,000.
covering a total of 17.7km. Fleet expansion: 13 more train sets of 6 cars per set configuration. The proposed new LRT line from Kota Damansara to Cheras, measuring 42km, will be upgraded to a Mass Rapid Transit (MRT) system because of high population density. A possible extension from Kota Damansara to Sungai Buloh KTM. 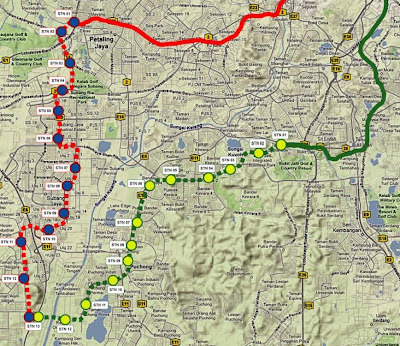 The proposed alignment showed the new line running from Kota Damansara along Persiaran Surian to the Damansara-Puchong Expressway and then heading towards the city centre along the Sprint Expressway, through Bangsar Baru and Jalan Bangsar. It will then run parallel to the existing Kelana Jaya Line to Nu Sentral in KL Sentral, then Pasar Seni and Masjid Jamek before heading to the Golden Triangle along Jalan Raja Chulan. The route will then pass Pasar Rakyat in Bukit Bintang and then Jalan Tun Razak where it will join Jalan Cheras. 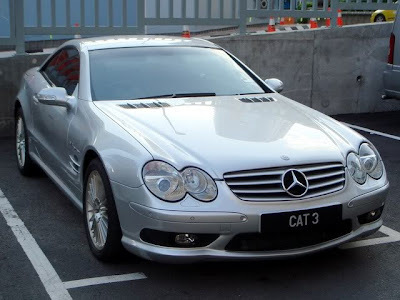 It will continue along the road and the Cheras-Kajang Expressway to the Balakong interchange near Cheras Batu 11. 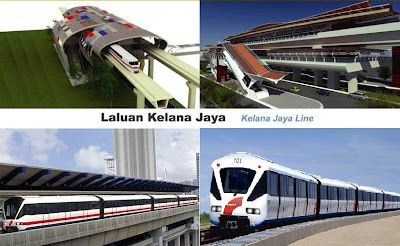 Other rail networks mooted for Klang Valley include a possible extension of KL Monorail, extension of KLIA Express to the proposed permanent LCCT, revival of Putrajaya and Bandar Sunway Monorail, Shah Alam Monorail, coastal KL - JB high-speed train and a proposed integrated network connecting urban centres within Selangor by the Pakatan Rakyat government. 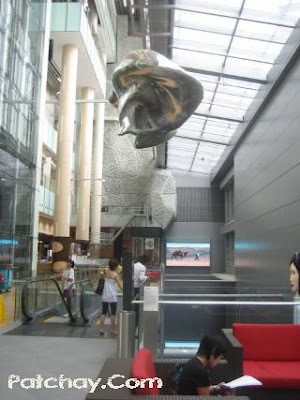 I was sooo freaking busy lately... but anyway I was in Singapore chillin out at Ion Orchard and Orchard Central over the Merdeka weekend. 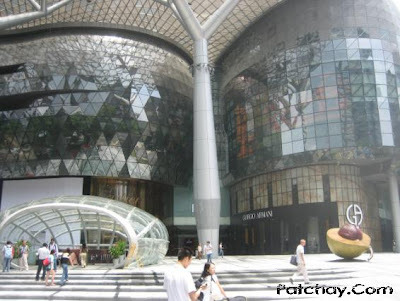 Ion Orchard is like Singapore's response to KL's Pavilion. Very nice facade but the interior is simply too small, low ceiling, cramped and congested, especially the food court during office hours. The Louis Vuitton there is amongst the best retail store I've ever seen. 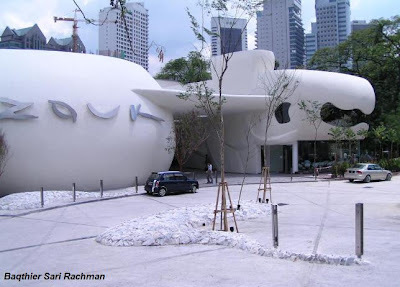 It is also the largest LV boutique in Southeast Asia. Orchard Central has a hippie decor but the mall is still quite vacant. The outdoor escalator overlooking Orchard skyline is quite cool. I was quite disappointed with the stores in Orchard Central especially the small small ones that look like stores in pasar malam, except these ones selling expensive goods. The 10 floors just failed to excite my shopping/dining, for that I would choose Ion Orchard. Ok I'm off to bed... cya soon! In Singapore, a woman was seen stopping by the road and then aggresively hitting his male partner with her high-heel shoe in his face and private part for many times. What say ya? What should the guy do? 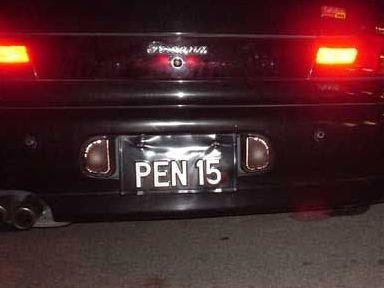 Friend: Damm funny liao... pat you must watch it! "I forgot to tell u... dun wear tight tight jeans come lah"
" U potong rambut cukup lah, yang lain tak perlu potong punya"
Finally, the weekend is coming. 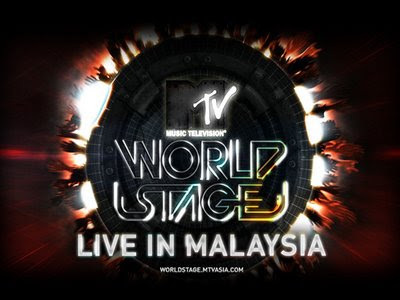 the biggest CONCERT is coming to town! By 2012, we will welcome yet another lifestyle-themed "Megamall". 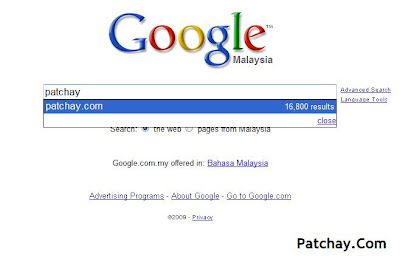 This time it is in the KL Sentral locality. 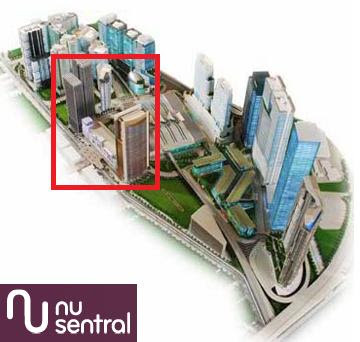 Nu Sentral will consist of a new 7-storey shopping mall and an adjoining 27-storey office tower, located adjacent to the KL Sentral transportation hub and along Jalan Tun Sambanthan. 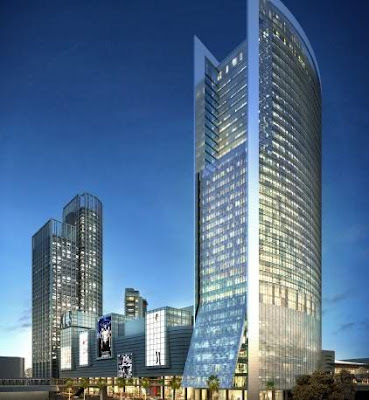 Nu Sentral is part of a multi-billion "Lot G" integrated development that will also include another 2 office towers and a boutique hotel standing beside the mall. 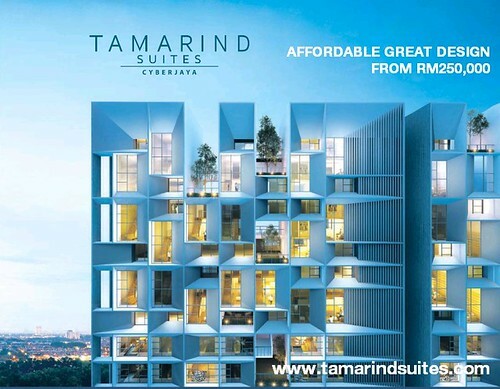 The mall will be linked to Stesen Sentral, a nearby monorail station, nearby office towers and the proposed integrated station for a new Mass Rapid Transit line linking Kota Damansara and Cheras. 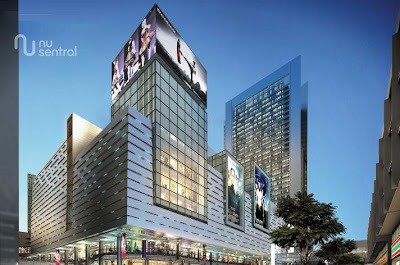 Nu Sentral will also be Kuala Lumpur's first "green" shopping mall by adopting internationally recognised building standards as well as implementing environmental-friendly and energy saving features. Natural daylight will be brought in by a series of "skylight boxes" randomly placed at the roof of the atrium. Above the 7-storey mall, there will be a 2-acre sky park, a megaplex (cinemas) and leisure space for cafes, open air events and concerts. The "rooftop" entertainment concept will surely be the talk of the town when it opens. 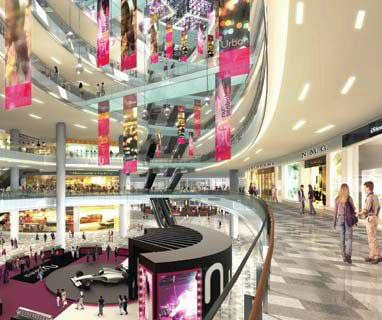 Nu Sentral is destined to be a new shopping paradise in Kuala Lumpur, with plans already underway for many more shopping malls around the city centre such as the large-sized mall nicknamed as "Vision City Forest in the Mall". 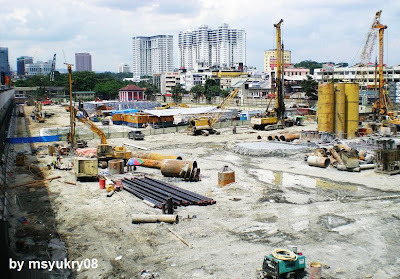 Nu Sentral is already under construction before the launch yesterday.